On our summer road trip, we spent four nights in San Francisco. When planning the itinerary for the trip I made sure to allow plenty of time there. I absolutely love the city– the crisp sea air, the beautiful architecture, and the amazing restaurants. San Francisco has so much character and history; I’m always looking for an excuse to visit! 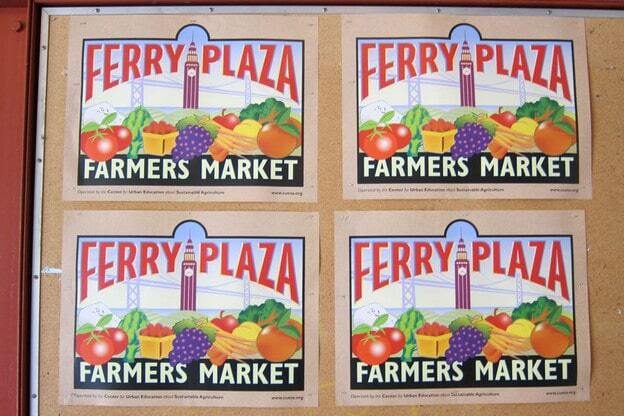 One of our first stops was the Ferry Plaza, a huge seaside hall that has been overtaken by local food brands. I’d been before, but my husband never had. I was excited to introduce him to the place. 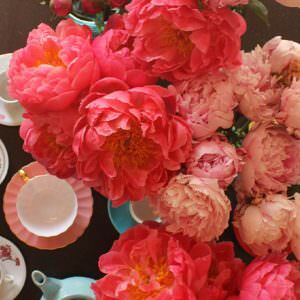 It’s truly a feast for the senses! Ferry Plaza is open all week long, and it also hosts a special outdoor farmer’s market on Tuesdays, Thursdays and Saturdays. When the market is going, there are tons of fresh and local options– anything you could want in terms of ingredients can be found there. Our first stop was an outdoor cafe next to the farmer’s market. It was a beautiful, sunny day, and we felt like eating something light before exploring the building. 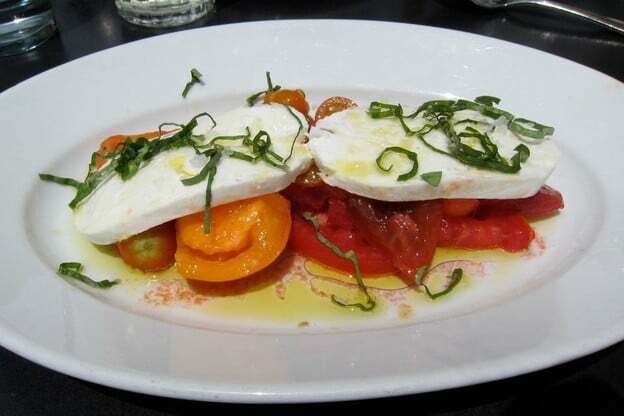 I ordered this caprese salad with mozzarella, heirloom tomatoes, and fresh basil. The simple salad was sprinkled with sea salt and drizzled with olive oil. The tomatoes were wonderfully sweet. Everything tasted like it had just been picked earlier that day… I guess that’s the advantage of having a cafe next to a year-round farmer’s market! Next, we explored the inside of the ferry building. It’s set up like a long hall, with small stands and little stores offering their food-related wares. There are bakers, butchers, organic markets, cheese mongers, olive oil farm stands, gourmet chocolatiers… there’s even a stand devoted totally to mushrooms and mushroom-related products! 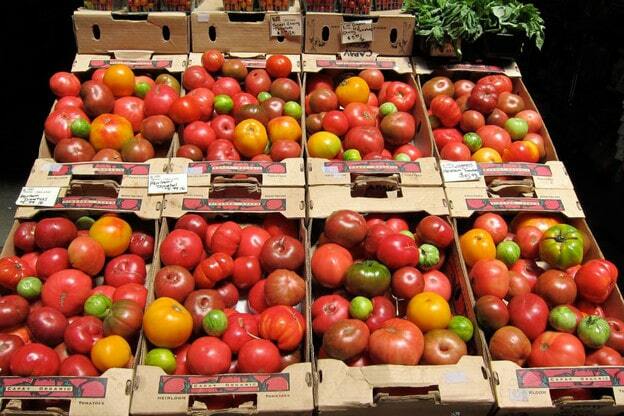 The fresh produce is so colorful and ripe– you can smell the freshness of it walking past. I wonder if this is where the cafe buys their heirloom tomatoes? I had to stop at a stand selling local artisan cheeses. If we hadn’t been on the road, without a refrigerator, I probably would have spent a pretty penny here. Alas, my ice chest would only keep things cold so long. 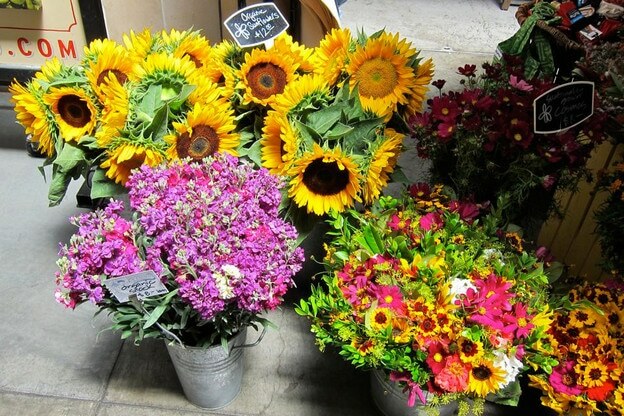 You can find pretty much anything in the ferry building, including freshly cut organic flowers. 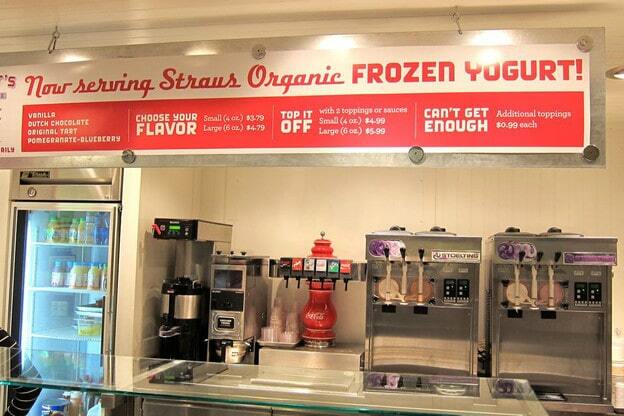 My favorite find of the day was Straus brand organic frozen yogurt. Straus Family Creamery is a family-run dairy Marin County. 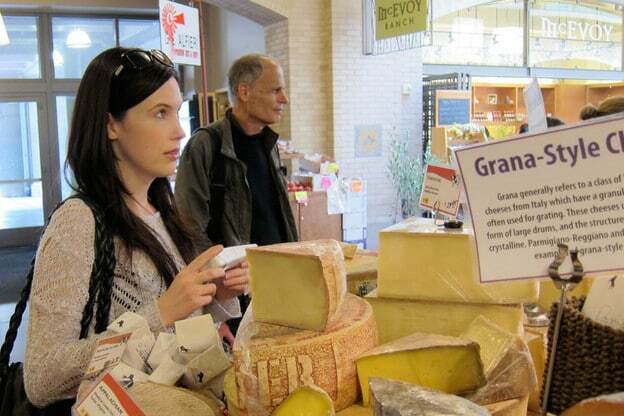 They were the first certified organic creamery in the United States– quite an accomplishment! I couldn’t help but sample the product. With toppings like raspberry puree, chocolate covered espresso beans, and Miette gingersnaps, who could resist?? 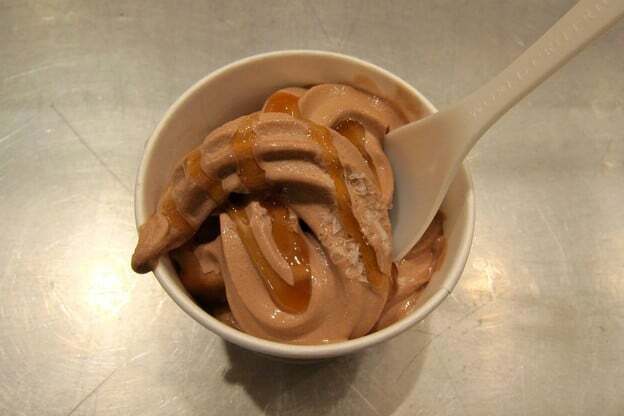 I chose dutch chocolate frozen yogurt with caramel sauce and Maldon sea salt. Happy Tori! 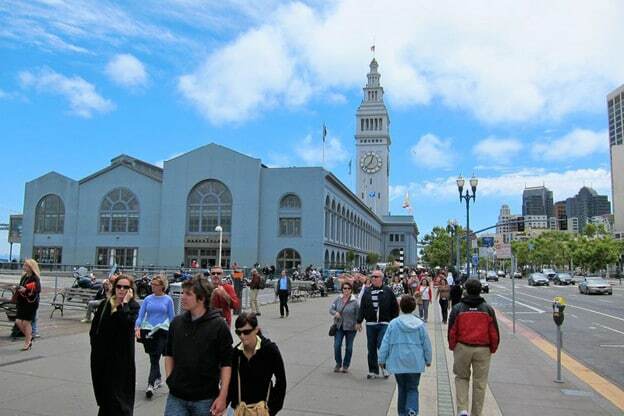 The ferry building is always an exciting outing, and I never fail to have fun tasting and exploring there. If you’re in San Francisco for a visit, I highly recommend it! When I’m on vacation, I’ve made it a hobby to collect cookbooks from the different places I visit. Some people collect stones or snow globes, I collect recipes. 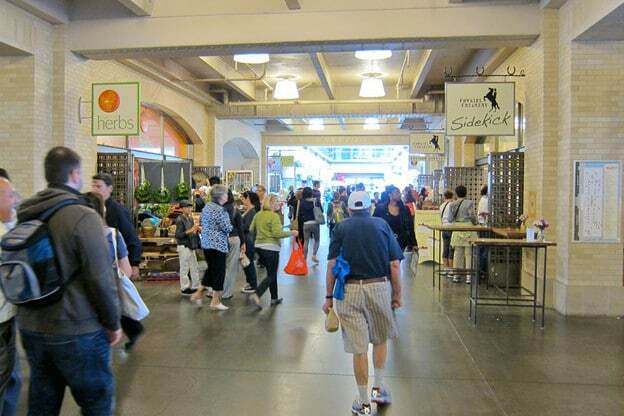 While in San Francisco, I discovered The San Francisco Ferry Plaza Farmers’ Market Cookbook. The book is full of fun, fresh, simple and seasonal ideas. It’s organized by month, highlighting the seasonal west coast produce available throughout the year in easy and tasty preparations. 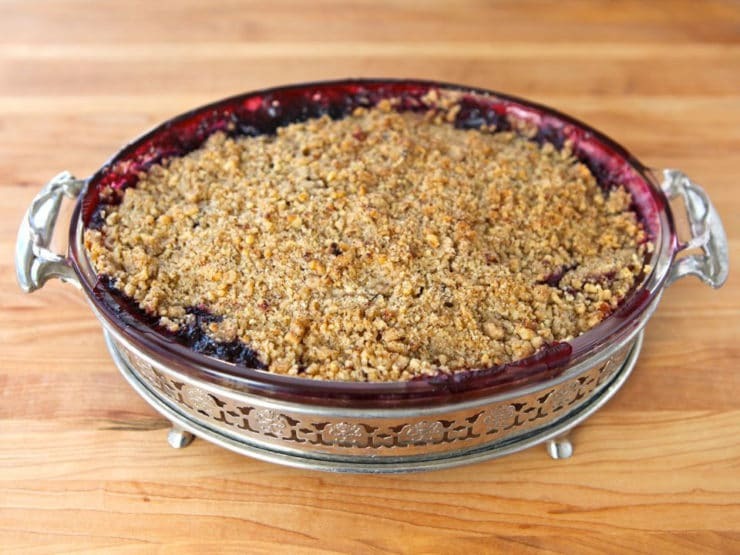 As I was thumbing through the book, a recipe for Blackberry and Nectarine Crisp caught my eye. I loved the simplicity of the dish, but I couldn’t resist making a few changes. 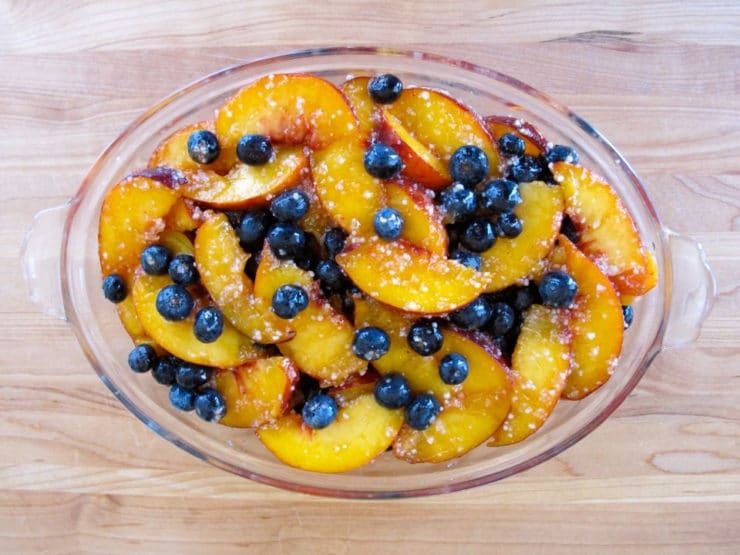 Blackberries and nectarines can veer towards tart, and I prefer a sweeter dessert, so I chose to make it with ripe peaches and blueberries. I added a touch more sugar to the filling to counteract any natural tartness from the berries. In the original recipe, flour is used to thicken the filling. When I bake pies, I prefer minute tapioca as a thickener, so I used that instead. 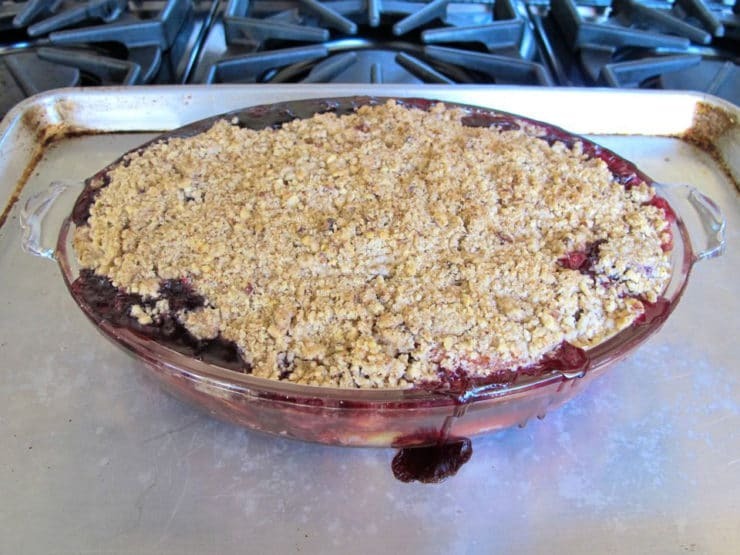 The result of my experimentation is this Peach and Blueberry Crisp, which turned out to be a resounding hit with our family. I hope you enjoy it as much as we did! 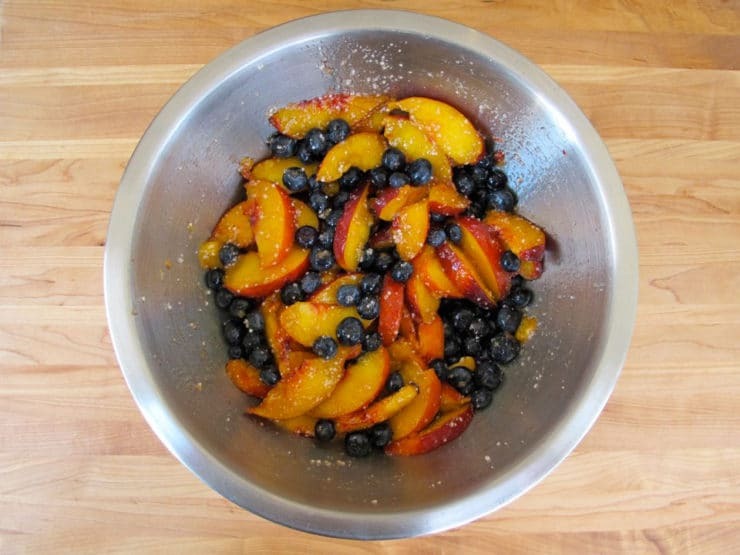 A simple seasonal dessert recipe with peaches and blueberries, inspired by the San Francisco Ferry Plaza Farmer's Market. Kosher, Dairy. Place a rack in the middle of your oven and preheat to 375 degrees F. In a food processor, combine the first 5 topping ingredients - flour, brown sugar, sugar, salt, and cinnamon. Pulse a few times till ingredients are blended. Add nuts and unsalted butter to the processor. Continue to pulse till the mixture is combined and crumbly. Do not over-process-- you want some texture to the nuts and bits of butter in the mix. 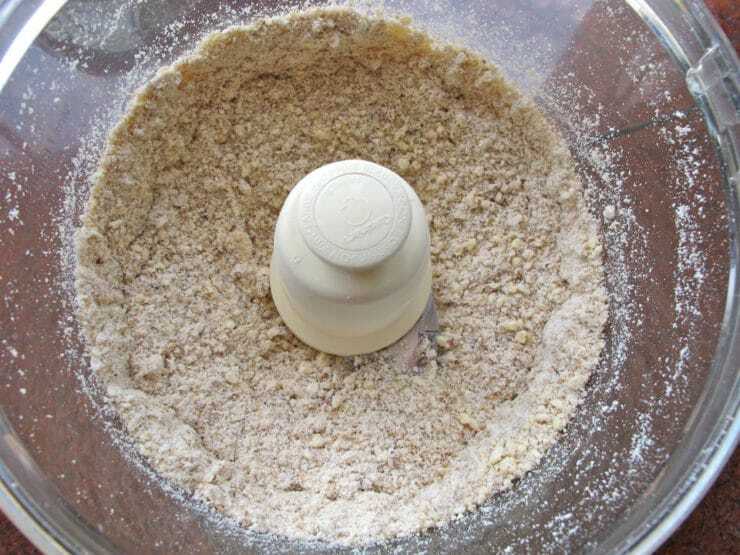 If you don't have a processor, you can instead mix the dry ingredients in a bowl, then add the butter mixture with your fingers or a pastry blender. Work the butter into the mixture till a crumbly texture forms. 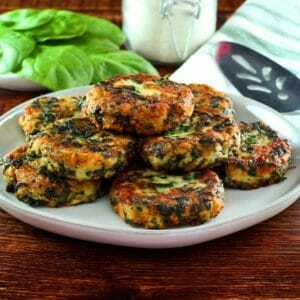 To make the filling, combine all ingredients in a large bowl and stir gently till combined. Let the mixture stand for 15 minutes. 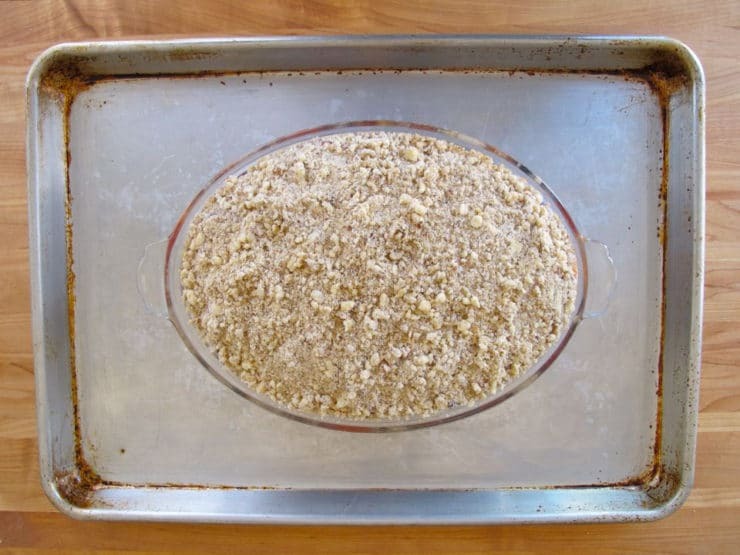 Pour filling mixture into your baking dish and spread it in an even layer. Put the crisp and cookie sheet in the oven and let it bake for 50-60 minutes, turning once during baking, till the crisp is lightly browned and the fruit filling is bubbling. Remove the crisp from the oven and allow to cool for at least 15 minutes before serving. Serve the crisp warm topped with vanilla ice cream or crème fraîche. Can you make this recipe pareve? 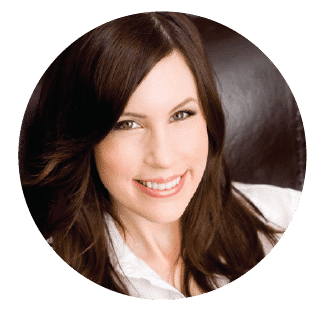 Hi Jennifer, you can sub a non-dairy butter substitute (like Earth Balance buttery sticks) for the butter, and use a dairy-free ice cream. Enjoy! I made the blueberry peach crisp three times this month.But I wonder if peeling the peaches, which I did, made a difference. I liked it and the people I made it for LOVED it. Hi Helene, I’ve never peeled the peaches and no complaints here at home, but you are certainly welcome to peel them if you prefer! 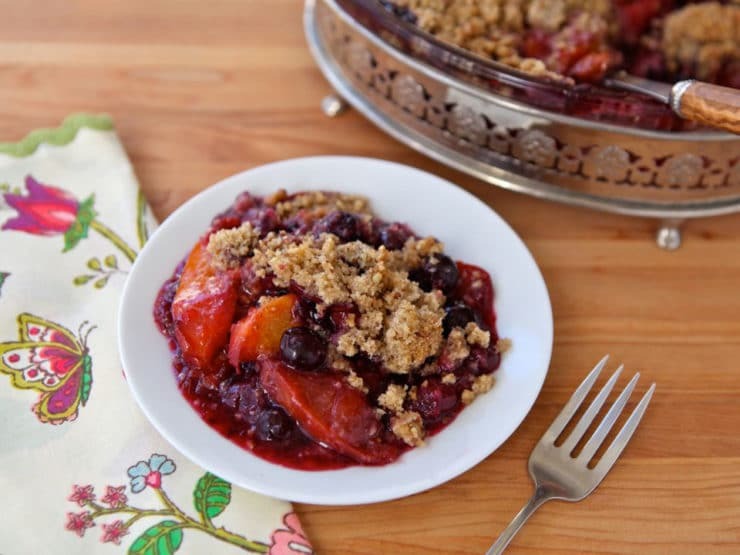 I love the idea of peach crisp, but blueberries are getting kind of pricey on the east coast… If I were to substitute nectarines, about how many would I need? Hi Alice– 2 small ripe nectarines should work nicely as a sub– or, you can use one more large ripe peach. Enjoy! What do you think of a margarine substitute? Viola vegan. Hi Jonathan, I’m not a big fan of margarine, but you can certainly make the substitution. I’d recommend Earth Balance natural buttery sticks, they’re the closest thing I’ve found to butter and I think it’s the healthiest margarine out there. If you can find it organic, even better. Enjoy! Loved the recipe. My family enjoyed the heck out of it. Loved the thickening of the tapioca. Do you think this would freeze well? I made this for my family and they absolutely loved it!!!! It was so delicious and the vanilla ice cream was the perfect balance with the dessert! The ice cream seriously makes the dish, right?? So happy you liked it! I made this recipe yesterday. So easy! So delicious! It was gone before the night was up. I substituted blackberries from our garden for the blueberries, and it was a hit! Yum! Very happy you liked it Maren! I love it when a recipe is so simple and so good, don’t you? Please explain minute tapioca. Thank you. Hi Martha, Minute Tapioca can usually be found in the pudding section of the supermarket in a small box. It’s a type of tapioca (think tapioca pudding), and it is quick-cooking. It can also be used as a thickener. I prefer it for thickening pies, crisps and puddings rather than corn starch or flour– it gels better and doesn’t change the color of the fresh fruit filling (flour and cornstarch can give the filling a milky appearance). SF is one my favorite places as well. I visited ten years ago and I think I am due for another one. I don’t remember visiting this location but it will sure be on the list next time. Looks yummy! Glad you had a good trip!